This whimsical modern-dress Hansel is less widely available than other versions, but easily one of the most inventive and entertaining. Beginning in a shabby contemporary kitchen, the production’s atmosphere is initially realistic, but changes to eerie surrealism when Hansel and Gretel enter the wood and find themselves lost in a jumble of gigantic, distorted household items. Then in Act II, kooky fantasy takes over as the children find a house made of pink birthday cake, then meet a pink-lace-clad Witch with skunk-striped, horn-shaped hair, who magically induces them to do silly dances while gleefully stirring “juicy chunks of girl and boy” from a meat grinder into her gingerbread dough. In another unique touch, the production implies that the woman Hansel and Gretel call “Mother” is actually their stepmother, as in the Grimms’ tale. This leads to a very poignant Dream Pantomime in which they dream of a joyful picnic with their father and real mother – who all too soon is taken to Heaven by the fourteen angels, leaving her children in tears. Fortunately, their stepmother is much less wicked than those of traditional fairy-tales, despite her gruff exterior. Suzanne Johnson is a magnificently boyish Hansel with an ideally warm, endearing mezzo, while Christine Douglas, though her face and voice are both slightly mature, is a charming Gretel. Both offer lively, effortlessly childlike characterizations without a trace of syrup: these siblings are a feisty, impish pair who constantly bicker and tease each other, but bond together when it matters. Margaret Haggart’s excellently-sung soprano Witch is surprisingly subdued, but in an interesting, refreshing way. Despite her outlandish appearance this Witch is no caricature, but simply an ordinary, cheerful old lady who just happens to have demonic powers and eat children. Malcolm Donnelly provides the Father with a handsome, robust baritone and appropriately rugged yet jolly stage presence, while Elizabeth Campbell is slightly sour-toned yet fully believable a caustic, cigarette-puffing Stepmother. Gail Robertson is a rich-toned Sandman, Kathryn McCusker an endearing Dew Fairy (here a goofy ballerina with thick glasses), and Johannes Fritz leads the orchestra in a lively, charming musical performance. 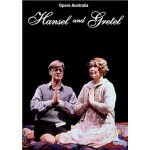 The opera is sung in Norman Kelly’s charming English translation, the same one heard in the Met’s 1982 Hansel telecast, but with various changes to reflect the unique staging as well as the Australian venue (e.g. “bikkies” instead of “cookies”). This Hansel is probably a bit too unusual to be an ideal introduction to the work, but nonetheless it’s easily one of the best versions available. I wholeheartedly recommend it for children and adults alike. Unfortunately, I can’t find a Youtube clip from this production. All the more reason to look for it and rent or buy it!